On a busy Thursday morning kitchen staff at the Asia restaurant are busy calling out to one another in Kurdish as they prepare for the lunch rush. In the front window, one of them turns shawerma meat stacked up against a flame, making sure that it is evenly roasted. Down the counter, another takes fresh balls of dough and throws them into an oven to make Kurdish flatbread, called naan. Others are busy chopping vegetables. Amidst the shouts in Kurdish and the scent of bread, it is easy to forget that we are not in the Middle East, but in Peterborough, England. With its famous Gothic Cathedral, Peterborough, in the heart of British Cambridgeshire, is an unlikely location for a vibrant Kurdish population. 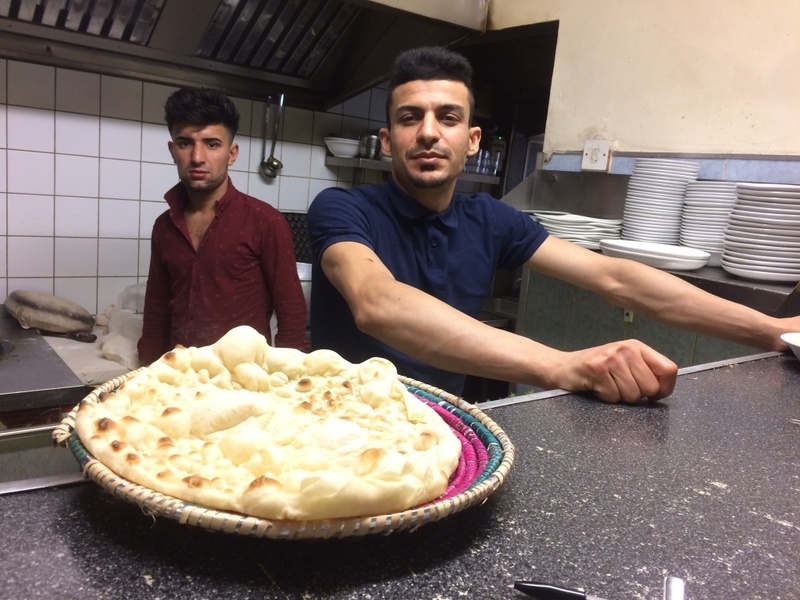 But as thousands of Kurdish immigrants from Iran, Iraq and Syria are making their way across the European continent in the recent migration rush, many are finding their way to this small British city, where an already existing Kurdish community is welcoming them. And for young men, many who traveled as unaccompanied minors and have found themselves far from the familiar, a small restaurant downtown has been a home away from home. Faizadi Muradi, originally from Chor, near Marivan in Kurdish Iran, is 31 years old. After his father was killed, he felt that it was unsafe to remain in Iran. So in 2007, he made the long journey alone, traveling from Iran to Iraq, then to Turkey, and finally to the United Kingdom, in a journey that took more than two months. 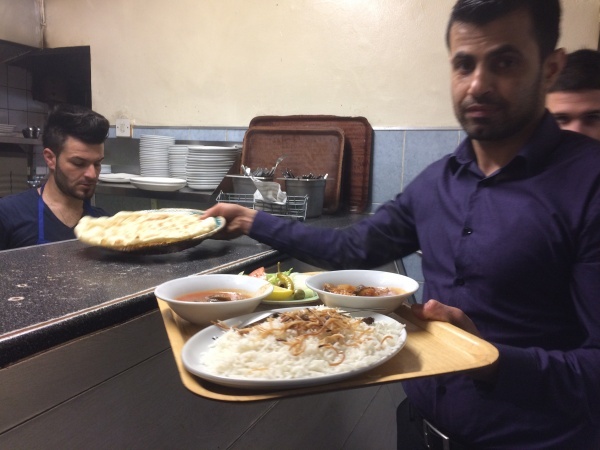 Now, nearly a decade later, as a chef and waiter at Asia, he helps to welcome new Kurdish migrants who feel out of place in the city, while also preparing food for working class members of Peterborough who have newly discovered delicious, cheap and filling Kurdish food. “Muslims, Christians, Hindus: everyone comes here to eat,” he says proudly. He speaks to me while he busily chops lettuce. His specialty, he says, is dolma. While in some Middle Eastern countries this refers to stuffed vine leaves, in Kurdish culture it refers to all kinds of stuffed vegetables, cooked together—anything from stuffed vine and cabbage leaves to stuffed zucchini, onions, and tomatoes. “My auntie taught me how to make it,” he says, smiling. To spend time in Asia restaurant is to recognize that even across borders, Kurds share a common food culture. Though the Kurds do not have their own country, the region referred to as Kurdistan by Kurds includes areas of Syria, Turkey, Iraq, and Iran, where an estimated 25 to 35 million Kurds live and share a common language. Their food culture is remarkably diverse, containing influences from Iran such as herb stews, Arabic influences such as kofta and baklawa for dessert, and biryani, a beloved rice and meat dish we usually associate with Indian food, but which in fact has its origins in Persia. Some dishes have Armenian influences—an Iranian dish even has stuffed rose petals. Lunch is the largest meal of the day in Kurdish culture. The restaurant Asia focuses on the classic Kurdish dishes shared by almost all Kurdish cultures: freshly cooked naan flatbread, homemade yogurt and tea for breakfast; lentil soup, kebab and kofta, stuffed dolma, lamb and rice, and biryani. Once a week specials include patcha: a labor-intensive dish of the head, leg, shoulder and intestines of a cow, sheep or lamb—cleaned, boiled in water with spices and cooked for four hours. The spices are ordered from abroad to keep the taste of home. Sako Lugman arrived from Kirkuk, in Iraq, in 2013, traveling in the back of a lorry. 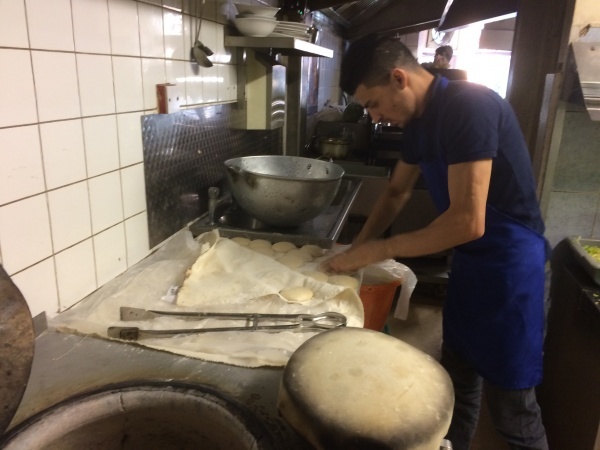 Now, he’s learning how to cook in Asia’s kitchen, and calls easily back and forth to other workers in Kurdish.He credits Asia with helping him find his way on a new continent. “I had nothing, and I arrived here, and they gave me something to eat,” he says. 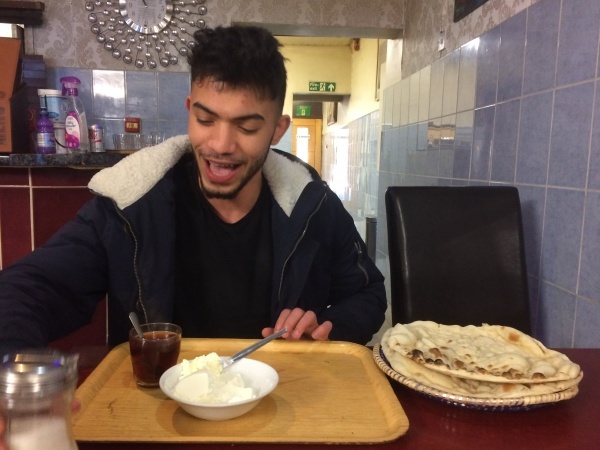 I sit down at a table with Omar Mohammed, a customer originally from Syria, who claimed asylum in England after fleeing. He is originally from Ayin Darah, a village northwest of Aleppo in Kurdish Syria. He comes here in the morning for a simple cup of fresh yogurt and some warm naan bread, the standard breakfast throughout the Kurdish speaking world. He arrived in the United Kingdom three years ago as a seventeen-year old unaccompanied minor, also after traveling in the back of a lorry. He traveled alone from Syrian Kurdistan to Turkey before making his way to the UK. A simple breakfast of freshly made yogurt, tea, and warm naan bread. The youngest in his family, he now works in an appliance shop and saves up to visit his family every year, who live in Erbil, in Iraqi Kurdistan. He proudly tells me that he’ll be a British citizen in a year or two. Every day, he eats something from Asia. The restaurant functions as much as a community center as a place to eat: with pictures of Kurdish cities on the walls and the television on the wall tuned to the news. The customers come in quick succession: an early morning rush to buy bread freshly made in a tandoori oven and served on a traditional basket woven in Kurdistan. A lunchtime rush is for lentil soup or kafta, patcha, dolma and biryani, washed down with the restaurant’s homemade ayran. The cooks have a knack for using less expensive cuts of meats with delicious sauces, so that even lamb dishes can remain affordable for customers who want a taste of home. In the meantime, British people come into the front section to order vast shawarma sandwiches. Faizadi says that their customers are not only Kurdish, but are also Arabic, Polish, Lithianian, Russian. The food is fresh, and the prices are cheap—which means that Asia is becoming not only a place for Kurds to meet one another, but for the other inhabitants of Peterborough to meet them, too—through their food. Jawad Ismael, a customer originally from TakTak, an Iraqi city on the Iranian border arrives to buy bread. He came to England fifteen years ago, in 2002, but he still stops into Asia for a reminder of the world he left behind. “Anything you buy here tastes like back home,” he says. Fresh bread is made by pressing it against the walls of the oven.